Motorola Adds Three ROKR Handsets to Line | OhGizmo! By Shane McGlaun on 08/05/08 • Leave a comment! Motorola has been unable to duplicate the success it had several years ago with its RAZR handset. Motorola is looking to regain some of its glory and its latest attempt to separate the mobile phone user from their cash is three new ROKR handsets. The coolest one of the trio is the ROKR EM30. This phone uses Motorola’s ModeShift technology to illuminate the keyboard. When the phone is in music mode the keypad with controls for music are red. When the phone is in talk mode, the handset keys are blue. The EM30 also features a FM receiver built-in with RDS 4 technology for identifying the song and artists being played. The EM30 is also compatible with Windows Media Player 11 and has a 3.5mm headphone jack built-in. 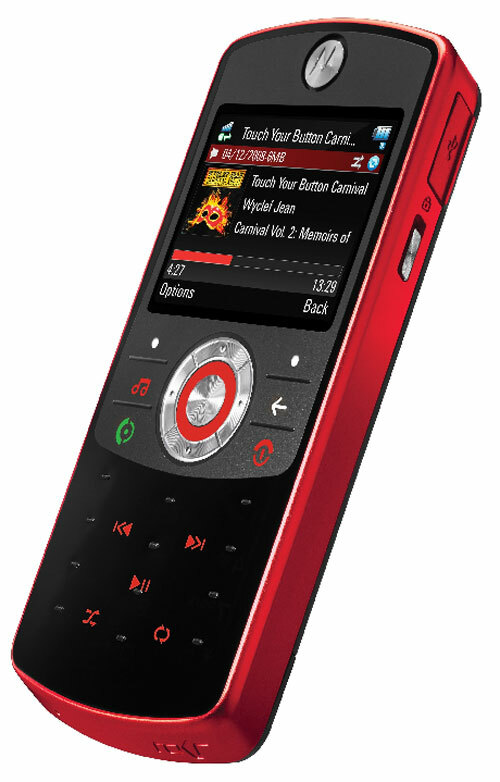 The ROKR EM28 is a clamshell phone that has touch-sensitive music controls that appear only when in music mode. Artists and song title are displayed on the outer clamshell display so the track can be identified without opening the phone. Music can be transfer via USB with drag and drop simplicity. The EM28 also has 3D sound effect to give music surround-sound quality. The third handset is the EM25 and it features a built-in FM tuner with RDS 4 technology. Dedicated music controls are available and the EM25 features FMShare that allows the texting of favorite radio stations to friends. SONGID technology is also featured to allow users to identify songs on the radio for purchase via download.